Mīmī 咪咪 is the name of the restaurant, and the main product of Mimi restaurant is xiǎomiàn 小面, literally meaning "small noodles", a kind of noodles whose strips are very thin — why it is called xiǎomiàn "小面" rather than dàmiàn 大面" ("big noodles"). Such "small noodles" restaurants, of which there are many nowadays, are usually selling a spicy Chongqing variety. The Chinglish translation comes from one possible word-for-word rendering of the four characters with "of" stuck between them. 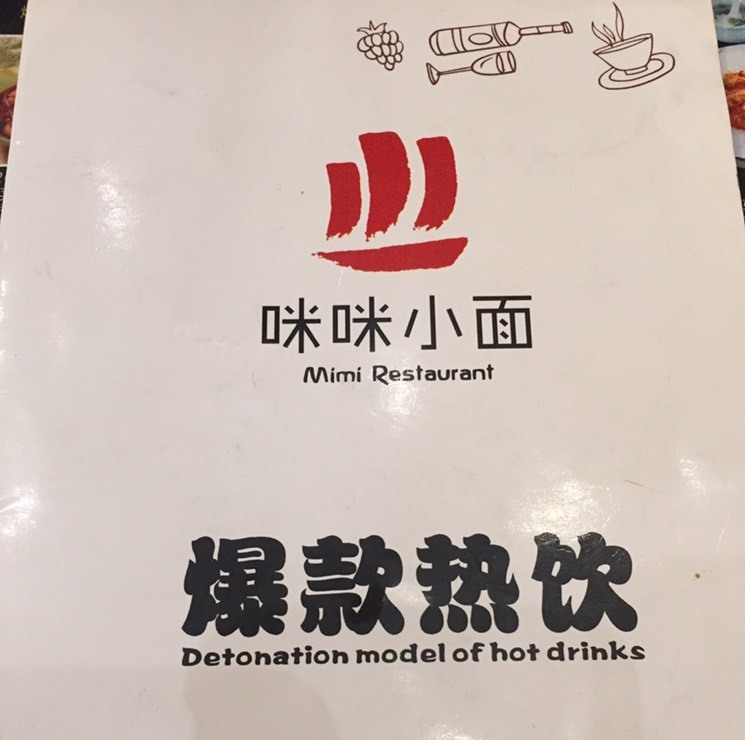 “Detonation model” seems to be a quite common way of translating “bàokuǎn 爆款” in mainland China. For example, this website translates “爆款” into “detonation model” for a travel package. This website translates “ shíshí bàokuǎn 实时爆款” into “real-time denotation model” and "INS bàokuǎn INS爆款" into "INS detonation model" for children's clothing. This website even claims that it can help you “create a detonation model” (“dǎzào bàokuǎn 打造爆款”). Sales of Mimi's hot drinks must really be blowing up.